Okay, it’s official. Lolcats are destroying the world. They’re even taking the creeping dread out of the Cthulhu Mythos. 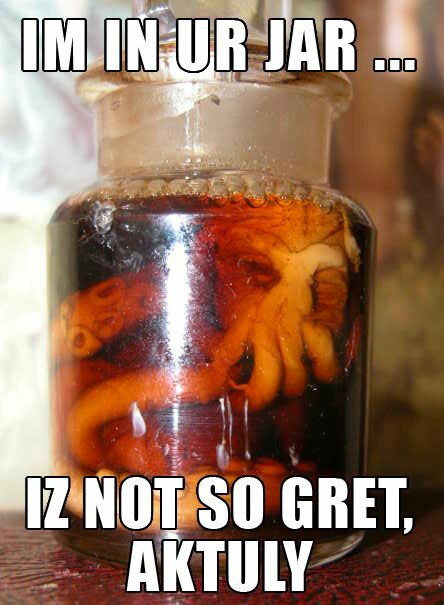 You can find the full spectrum of Lolthulhu here. Thanks to Ration Reality for opening the Necronomicon on this one. And in case you’re wondering what the hell a “cthulhu” is, here is the Wiki on it. Or, you could just go check out one of Lovecraft’s short stories, The Call of Cthulhu. But it may freak you out. Lolthulhu is pretty entertaining, but the one thing that really bugs me is the fact that they take the whole mangled spelling thing to ridiculous extremes. I thought the point was to disregard spelling conventions, not to be completely incomprehensible. I mean, come on: “gret”? WTF is that? Why not “grayt”, “grait”, “greyt”, or even “grate”? Nobody says “gret”, not a devil-may-care marble-mouthed hip-hop slob, not an ESL beginner with a thick accent, not a toddler just learning to speak. Isn’t humor supposed to hinge on something tangible or am I missing something here?